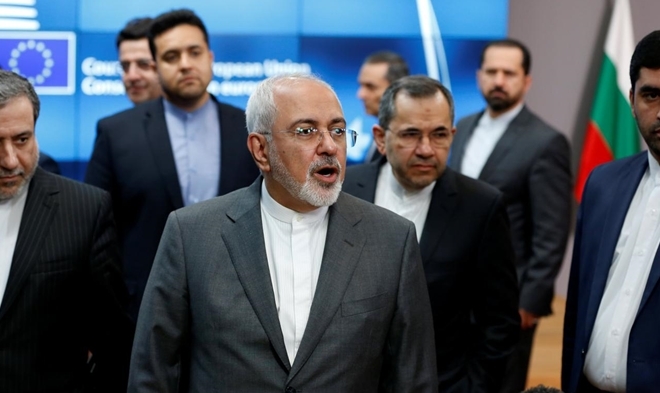 Iran’s Foreign Minister Mohammad Javad Zarif arrived in Brussels ahead of a meeting with his British, French and German counterparts later on Tuesday, holding “good and constructive” talks with EU foreign policy chief Federica Mogherini. “We are on the right path to move forward ... Whatever (is) decided should preserve and guarantee Iran’s rights ... Our talks (with the E3) will continue in the next two weeks,” he said, referring to Britain, France and Germany. “One of the questions that we need to ask the Americans is whether their final objective is to make the Iranians yield on its nuclear program or to get rid of the regime,” said a senior French official, acknowledging that Paris was concerned by the ideological shift in Washington since John Bolton was appointed U.S. National Security Advisor. French diplomats said they also wanted to assess Iran’s intentions in sticking to the deal, but also to see how open it was to serious talks on other Western concerns. French President Emmanuel Macron has said he wants to secure a wider deal after the U.S. withdrawal with four pillars: limiting Iran’s nuclear program in the short and the long term, restraining its ballistic missile program and curbing what the West views as its destabilizing behavior in Syria, Yemen, Iraq and Lebanon.